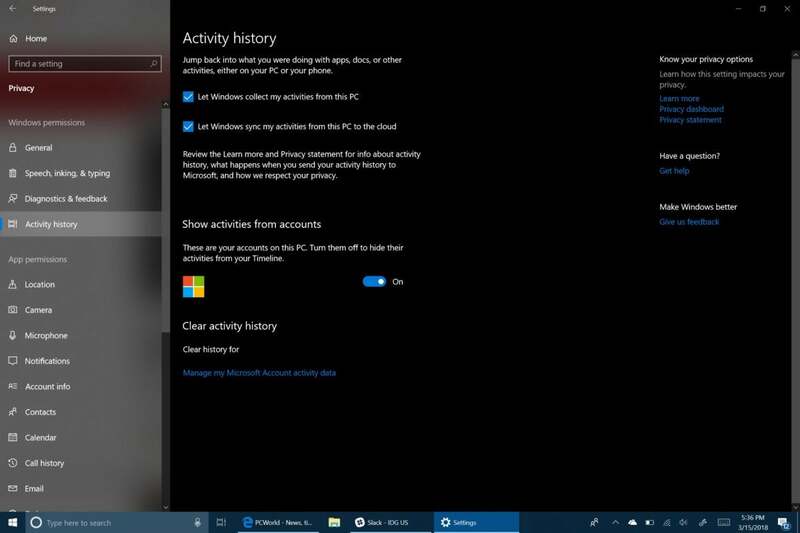 Here's how to use Microsoft's Windows 10 Timeline feature in the April 2018 Update. 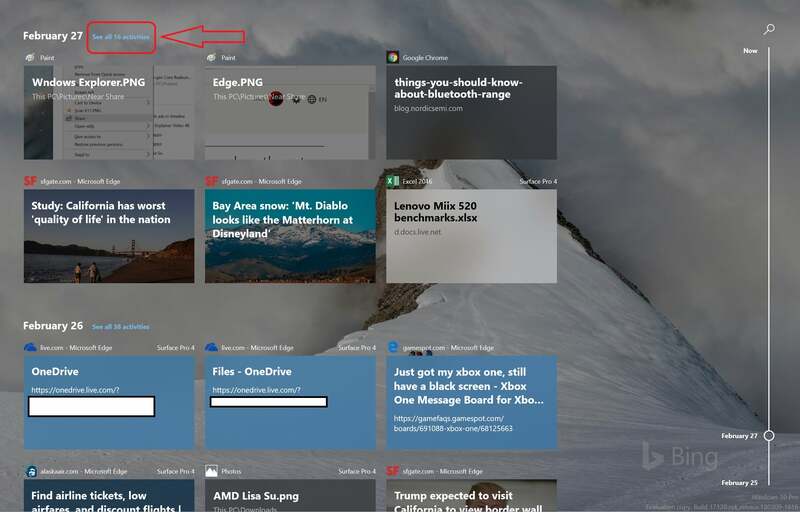 Windows 10’s Timeline feature helps answer the question: what was I working on? This handy, optional feature can track what documents and Web pages you’ve been working on over the past weeks and months, organizing them into a collection of documents you can quickly open to pick up where you left off. Timeline is part of the Windows 10 April 2018 Update, also known as Redstone 4. Chances are you already know where it’s found, even if you’ve never used it: Down in the taskbar, next to the Cortana search box, there’s a small icon called Task View within the Fall Creators Update. A slightly different icon identifies Timeline within the latest version. Part of the reason Timeline was added within Task View was because few users were using Task View. 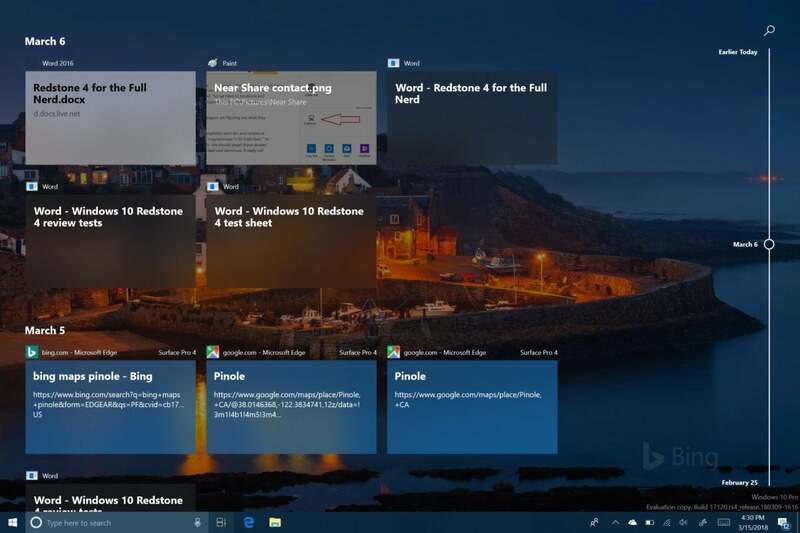 Task View hasn’t gone away; if you open Timeline, you’ll still see the gigantic icons representing the windows that you currently have open on your screen. But beneath these, you’ll likely see a new subheading: Earlier Today, which marks the beginning of your Timeline. Timeline lives within a familiar location at the left side of your taskbar. Windows assumes that you want Timeline turned on. If you don’t, or you’d like to manage how Microsoft uses your information, visit the Settings menu at Settings > Privacy > Activity History. There, you’ll have two options to check or uncheck: Let Windows collect my activities from this PC, and Let Windows sync my activities from this PC to the cloud. Make sure you search for “Activity History” when trying to manage your Timeline settings. The first checkbox is simple enough: If it isn’t checked, Windows will essentially disable Timeline. Checking the first box, though, collects your activities from only this PC. If you check the first and the second, your activities, and Timeline, will sync across devices. If you sign in with the same account on another PC, you’ll be able to pick up where you left off no matter which PC you use. If you’ve ever checked your browser history, you’ll have a good idea of how Timeline works. But instead of just tracking which websites you visit, Timeline tracks most of the applications you use, and the documents that you opened and edited. Timeline will also collect those documents you used at a given time into what Microsoft calls Activities. The assumption is that an Activity represents all of the documents you were working on at any one time: a budget spreadsheet, say, along with a few supplementary webpages and possibly a report authored within Word. Because it archives pretty much everything, Timeline can be a bit of a mess without some organization. The problem with Timeline, unfortunately, is that’s its unquestionably Microsoft-centric. Most of the productivity apps within Windows are owned by Microsoft, including Office. But I saw only one occasion where Microsoft tracked my browsing within Chrome or another browser. Otherwise, Activities cover the standard Office apps (Word, PowerPoint, Excel, and more) as well as Edge. If you opened a PDF, for example, you’d better hope you opened it within Edge. Timeline struggles when it can’t actually open the document it records, such as a photo within Photos that apparently hadn’t yet been backed up to OneDrive. In that case, you’ll see an obscure URL or string of characters, rather than the actual photo or object inn question. Theoretically, Timeline can go back weeks, months, or even years—but we’ll only be able to confirm that as the months go by. But a better way of navigating Timeline is via Activities, which are organized by time of day. Within Activities, Timeline looks virtually identical to how it’s shown here, but groups of documents and Web pages are grouped according to the hour or so in which you opened them. If you work on multiple projects at once, Timeline could be a valuable tool, allowing you to go back and forth between them. In this, it’s much like Task View, where various desktops of apps could be slid back and forth and exchanged for another workspace. I can see it offering peace of mind to the worker who can’t quite get everything accomplished before a business trip or illness, and must recreate their work environment. Alternatively, you can also use the small search box and look for keywords. But Timeline could stand for improvement, too: better, intelligent archiving of third-party apps and documents; one-click opportunities to open all of the documents in an activity, maybe even organizing them using Snap. 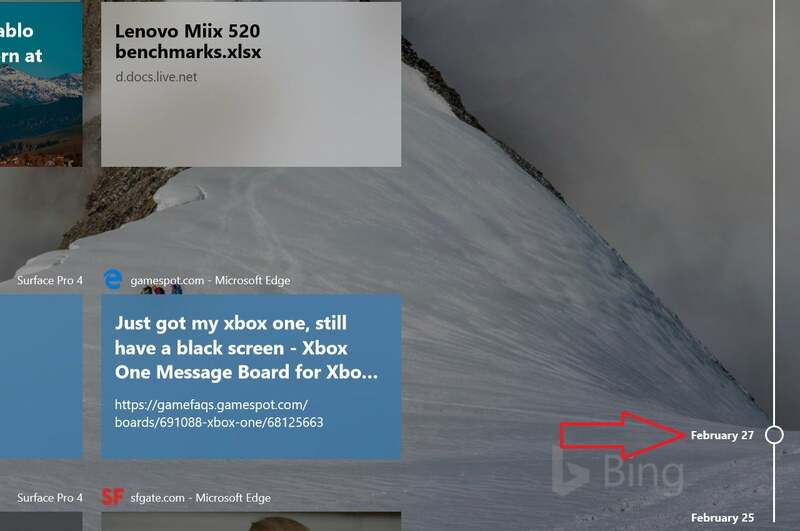 Microsoft originally designed Timeline in harmony with the new tabbed Spaces UI, after all. Timeline doesn’t reach out, shake you by the collar, and demand that you use it. Like many things in Windows, it hides shyly in your taskbar, waiting for you to take notice and introduce yourself. But expect facets of Timeline to show up in unexpected places: when you switch to another PC, check out a website on Edge using your phone, and more. Microsoft sees Timeline as a fundamental way to boost your productivity, as well as keep you nestled within its app ecosystem. It’s the marquee feature of the Windows 10 April 2018 Update, and it's worth a tryout to discover whether it works for you. 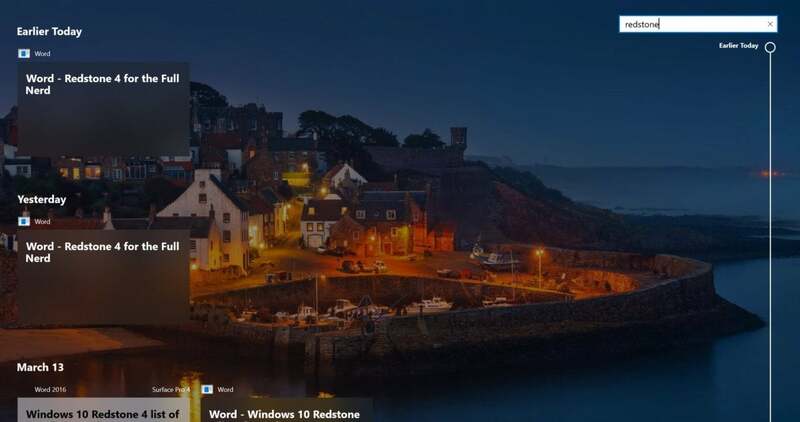 This story was updated on April 27 to note Microsoft's official name for Windows 10's new feature update: the Windows 10 April 2018 Update.